It means that investors should not expect more than 2% annualized from your bond allocation over the next five years, UNLESS you are willing to reach for yield via lower quality credit, non-US exposure, or increased duration. And what it means for an investor with an 8% overall expected return and a 60% equity / 40% bond mix. It also means that if you have a 60% equity / 40% bond allocation, to reach an 8% all-in annualized return your equity allocation needs to return roughly 12% / year over the next 5 years. Below we'll analyze if that 12% figure seems reasonable based on history and current valuations... it doesn't. 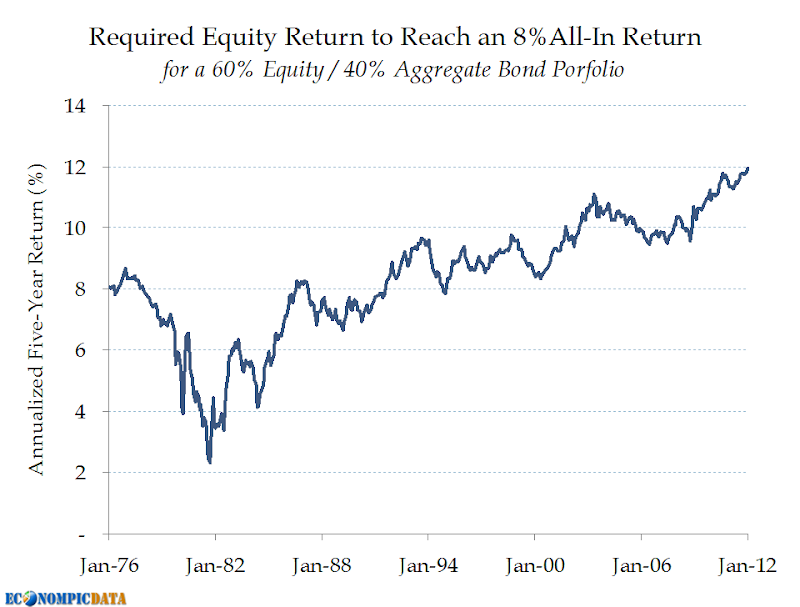 The first chart takes the yield to maturity of the aggregate bond index (shown in that previous post here) and backs into the required return on equities over the next five years to get an 8% all-in portfolio return. The current 12% figure is VERY high by recent historical standards. 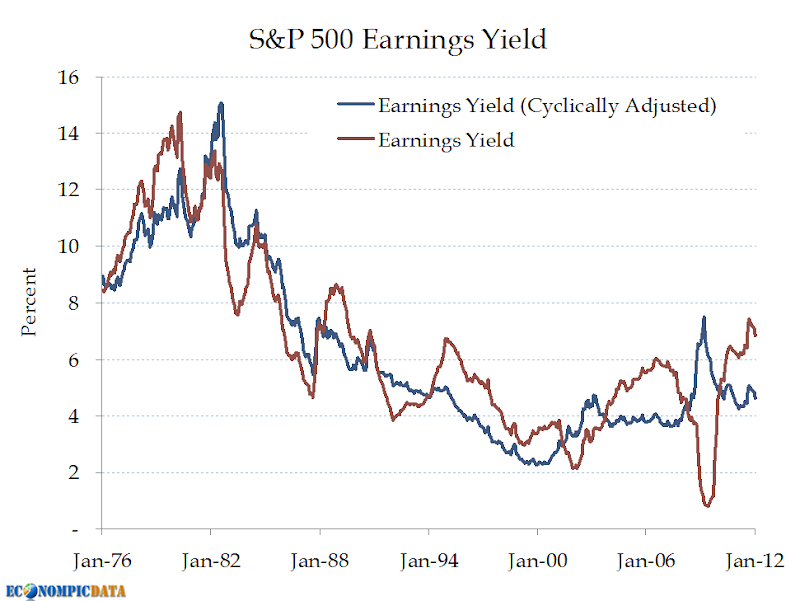 The next chart details where equity valuations currently stand based on earnings yield. The historical earnings yield of the S&P 500 (data pulled from Irrational Exuberance) is simply the inverse of the price / earnings ratio (a price / earnings ratio of 20 equals an earnings yield of 1/20 = 5%). The cyclically adjusted figure takes a 10 year average of earnings to smooth extended earnings during cyclical peaks (and depressed earnings during troughs). By this measure, things are much improved relative to the rich levels seen early last decade, but nowhere near the 12% figure. 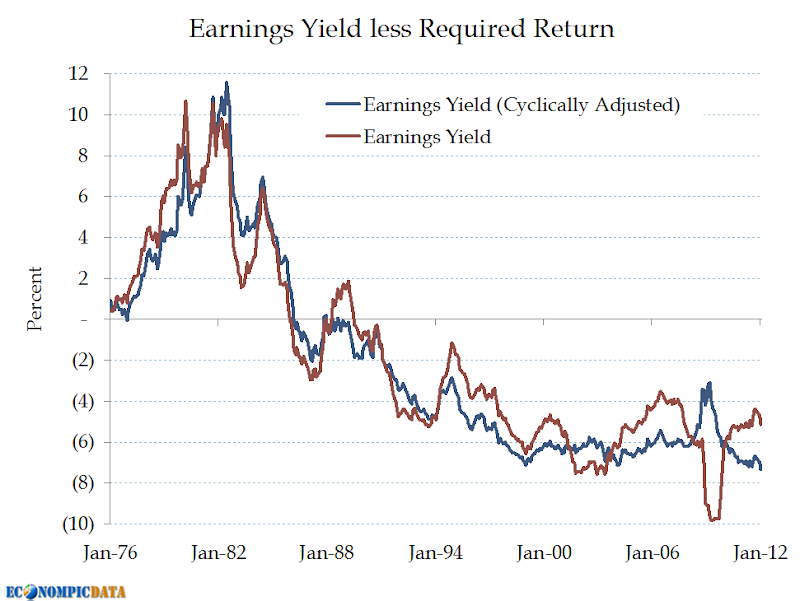 Past analysis showing the relationship between earnings yield and forward returns can be found here. The final chart outlines the difference between the earnings yield and equity returns required to reach the 8% return (i.e. the difference between the top two charts). It also shows how much growth is required for current earnings to get to that 12% return. By this measure earnings are 5.14% short and 7.33% short cyclically adjusted on an annualized basis. Possible? Yes, but it means an investor needs either earnings, the P/E ratio, or a combination of the two to increase by those levels each of the next five years (and remember that earnings are already near 3+ standard deviation relative to national income). This means an investor likely needs to look outside a traditional stock / bond allocation to reach their investment goal... better yet, if possible, revisit the 8% target outright.